Nigel started Sailmaking in 1981 in Cowes on the IOW. In 1990, he ran HOOD Sails OD production in Lymington. In 1995, he joined North Sails, as part of the North-Diamond Sails merger. Nigel ran North Sails OD in the UK from 1995, through the Spring of 2004 with his right-hand man, Paul Hobson. During the off season in 2000-01, Nigel completed a 6-month motorcycle tour of the United States, including visits to San Diego to see Vince Brun, and the 3DL manufacturing site in Nevada. Nigel started North Sails Ireland in 2004 which quickly became the dominant racing sail company in the area. Nigel has been racing Melges 24’s since their introduction into Europe in 1994 and has competed in 18 of 20 World Championships, with his best result of a 3rd overall. Nigel’s team won the UK Nationals five times, Key West Race Week one time, the French Nationals twice, Italian Nationals twice, was runner up at the Europeans and ranked number one in the world for two years with his team ‘Black Seal Racing’, run by Richard Thompson. As you can tell, he really enjoys competing in the Melges 24 Class! Nigel also races Dragons Internationally, RS200’s, Yachting World Dayboats with his kids where he is a three-time National Champion, which is really special for him since he did it with his oldest son and in 2017 with his younger son. He won another Dayboat Nationals when he was crewing for his wife as well. Nigel enjoys sailing the Dayboat with his family, as they are low key, fun, the class is nice, and the boat is great to sail for crew combinations of all kinds. Nigel’s highlights were working with Vince Brun and North Sails OD San Diego, where they took a 90% share of the Melges 24 sail market in 1998 through to 2008. North Sails totally dominated the class from a standing start. He really enjoyed collaborating with Vince, it was a lot of fun he said. 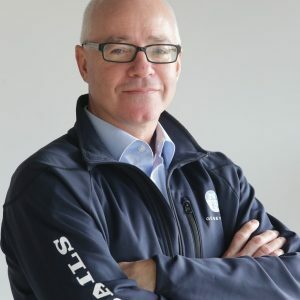 His other highlight was starting North Sails Ireland in 2004, where he built his team to be the best at sales and service in the area. « I have two great Sailors by my side, big thanks to Maurice O’Connell and Shane Hughes for your help and hard work to make North Sails Ireland the best it can be ».